 At Stewart-Amos Sweeper Co., we build every sweeper to the highest quality standards that incorporate our effectively simple design criteria. With ease of operation, service and maintenance in mind, we engineer and select each component and system to be rugged, reliable and uncomplicated while providing for the most effective and highest sweeping performance. Designed for effectively cleaning large volumes of bulky or heavy debris in a single pass. We make 6 models of Starfire Mechanical Broom Street Sweepers in 4, 4.5. 5, & 6 yd3 capacities. Two models are mounted on NON-CDL chassis. Two are available in single engine versions. Non-CDL models include the Starfire S-4c and S-4XL. Model sizes differ to fit various chassis sizes, but all share a high percentage of parts compatibility. This helps us ensure the high level of parts availability our customers have come to expect. 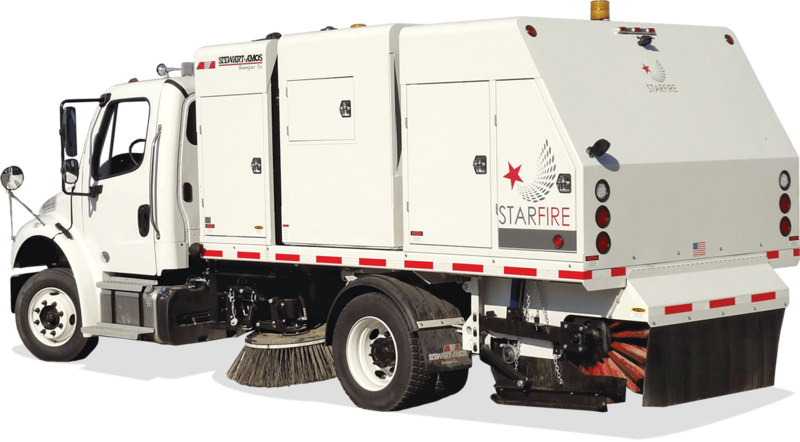 All Starfire models are designed with unique features to make your sweeping tasks safer, easier and more cost-effective. Deep cleans road surfaces by blasting fine particles and smaller debris from small crevices or hard-to-reach spots. 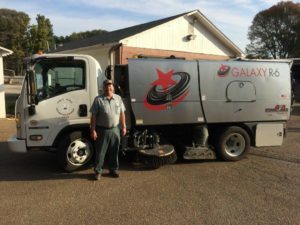 We make 3 models of Galaxy Regenerative Air Street Sweepers mounted on highly maneuverable, non-CDL chassis ranging from a 4.65 to a 6.12 yd3. All Galaxy models are non-CDL including the R-4, R-6, and the R-6XL. All 3 models offer bolt-together stainless steel hopper panels, 5-year no-rust through hopper factory warranties, & hopper top access doors that makes screen cleaning faster, easier, & safer. Like the Starfire, all Galaxy sweepers share a high percentage of parts compatibility for superior parts availability. I personally know that we use less fuel and the annual maintenance cost is lower. 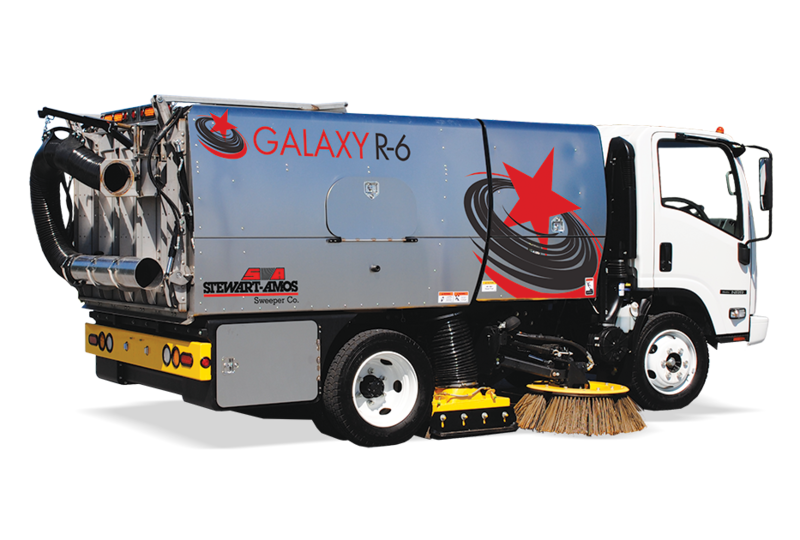 I would definitely purchase another Galaxy R-6 sweeper when the time comes. Aaron DavidsonDept. of Public Works, Bartlett, TN. 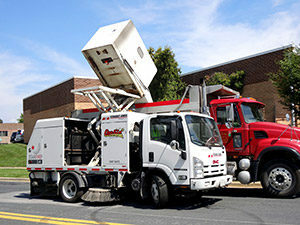 We couldn’t be happier with our friends at Stewart-Amos Sweeper Co. 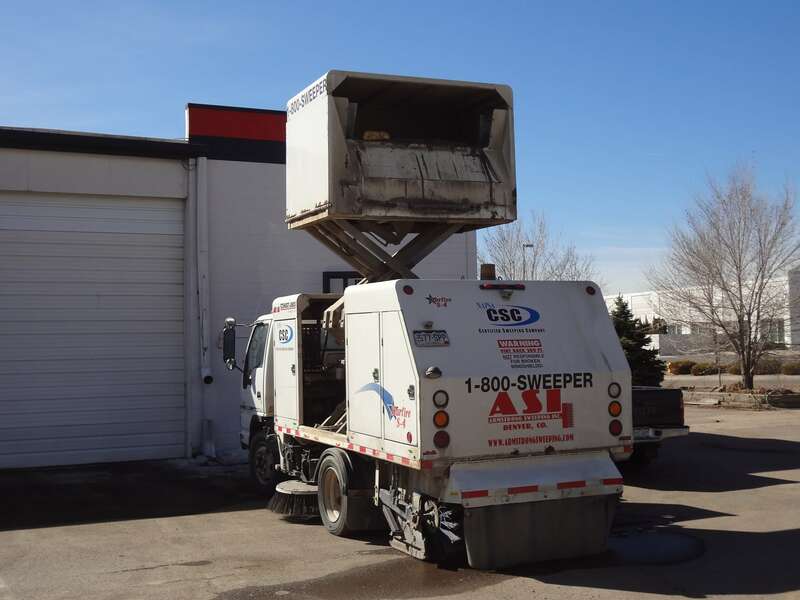 They build street sweepers that are extremely easy to operate, troubleshoot and maintain. Parts orders are shipped fast and their technical assistance is excellent. Having been in the sweeping business for over 25 years, it is truly a pleasure to deal with a company that displays a genuine interest in serving their customers. And the service continues beyond the sale – when I need repairs or replacement parts the team at Stewart Amos goes above and beyond to accommodate my request. I purchased a Starfire S-4 in 2010. The following year I didn’t hesitate purchasing a Galaxy R-4. When it comes time to add to our fleet again, I will definitely return to Stewart Amos.